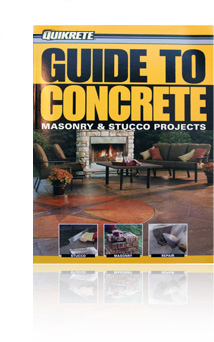 The Quikrete Guide to Concrete features step-by-step descriptions, full-color photography, quantity calculators and helpful hints and insights for dozens of concrete, masonry and stucco projects. This guide includes the most popular home concrete and masonry projects including the most common home repairs, but goes a step further by offering some of the most exciting new techniques for building concrete countertops and form-cast landscaping features, as well as techniques for coloring and texturing concrete for designer finishes. The Quikrete Guide to Concrete is available at your local home improvement retailer.